Via del.icio.us/bldgblog, we discovered the above photo from the National Maritime Museum. 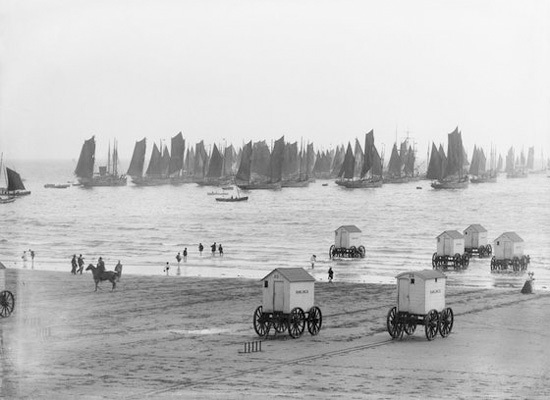 In the foreground, you see a group of bathing machines en route to the waters off Scarborough in Yorkshire, England. A common sight in beach resorts in the 19th century, bathing machines allowed women to change their clothes in private, reach the waters without parading through open stretches of beach in their bathing suits, and then frolic about in relative privacy and without violating contemporary notions of modesty. Queen Victoria certainly had one, and like it, these caravans of propriety, of social mores too foreign for our own eyes, were simple wooden structures. Lest they invite voyeurs, they were built without windows, otherwise there were little ones inaccessible to prying eyes. Some were made of canvas and still others were very luxurious affairs, but all of them were on wheels, pulled in and out of the surf by horses or brute human power. Perhaps there's something to be learned from this outmoded sea-side etiquette. Instead of building a palatial beach house with five bathrooms that will only be used as a summer retreat, you build something more modest, say, a tiny house — on wheels. When the next Category 5 hurricane eyes your neck of the woods, it, of course, retreats to safer harbors. You don't even have to ask tax payers to bail you out after damaging winds and storm surges have deconstructed your Martha Stewart Living centerfold into driftwood and then ask/beg/litigate again to pay the federal flood insurance of your replacement colossus designed by Toll Brothers. Considering the current economic climate, there probably wouldn't be enough federal money left that can be earmarked for beach fortification that only benefits you, who, in turn, probably couldn't afford a rarely inhabited second (or third or fourth) home. From a vernacular architecture of Victorian social conventions to a zeitgeist architecture of fiscal sobriety. In any case, part of the label of the photo reads: “Scarborough made the headlines in 1993 after a landslide caused the Holbeck Hall hotel to fall into the sea.” Holbeck Hall should have been on wheels, too. 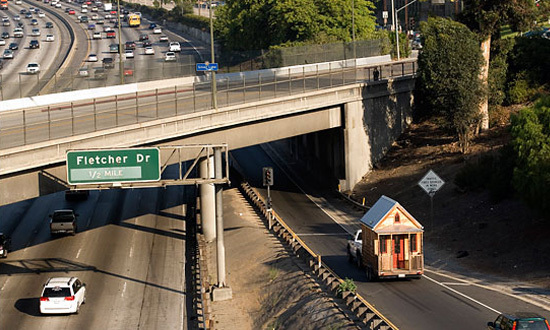 I believe that's one of the tiny houses made by Tumbleweed! D'oh, I identified and commented on the house before seeing the link already in the article. Just goes to show these houses are popular, I guess? If only Scarborough still had these! That actually looks like the owner for Tumbleweed homes. He drives a white pickup. I have always grown up on or near the beach (in Melbourne) and shared in other peoples' beach boxes in the 1950s. But they were always the exclusive property of special families, not ordinary families. Yet even today I cannot see what is so expensive about them - other than their rarity. They are simple constructions, no furniture to talk about, no micro wave, no air conditioning. A super history - thanks for the link.